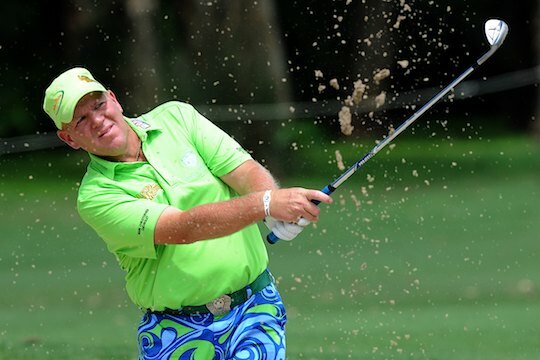 He’s won two major championships, but the next month or so could be the most important of John Daly’s life. The popular American has the chance to secure a card on one of our major golf tours, the European Tour, which would give him his first fully-exempt status, on any tour, for the first time in almost seven years. After competing in Shanghai at the BMW Masters, Daly intends to focus on the Singapore and Hong Kong events over the next two weeks in a bid to finish in the top 60 and qualify for the European Tour’s final showdown in Dubai. Daly has not been to qualifying school in the United States since 1990 but has shown glimpses of his old form this year and is desperate to earn a permanent Tour card somewhere. And with exemptions running out in the US, it’s Europe that is definitely shaping as the best alternative after the big-hitting former British Open and US PGA champion missed the cut at the recent Frys.com Open and McGladrey Classic in the US. Don’t think for a moment that Daly has given up on playing more golf in the United States. With changes to the US Tour qualifying to be introduced next year, Daly said he would gladly have a shot at getting back on the US Tour – if he had the opportunity. Yet he pointed out that the Race To Dubai [Europe] was big money as well and if he had a chance to contend there it would be equally as tempting. “If I get a card (in Europe), I can pick and play everything over there,” he said. Does Daly deserve another chance?